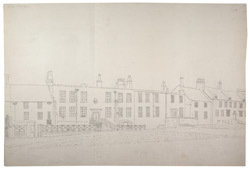 This is an outline view in ink of the houses in the square around Durham College. After Henry VIII disbanded the cathedral priory in the 1530s, the monastic buildings surrounding the outer court were remodelled to form these houses. They became the homes of a new assembly of prebends, or prebendary canons, replacing the original Benedictine monks. The medieval court became known as the college at this time.